Blogger.com, in its efficient way, informs me that this is the 100th post to this blog. The blog started in February 2009, but it didn’t really get going until July. Since then I’ve written, at a conservative rough estimate, 50,000 words of my own for it and typed or pasted another 20,000 words of quotations. No wonder I’m showing symptoms of carpal tunnel syndrome aka writer’s cramp. Time, therefore, to reflect. Why do I blog? Brevity. The posts are short, 500 to 1,000 words. On the one hand, I no longer have the stamina and resolve to write whole articles: and on the other hand the amount of information that keeps flowing in is more than I could cope with by in-depth treatment. If there were more people writing about the blog’s topics it wouldn’t matter so much, but we are all too few. At the same time, the posts are quick to read. Freedom. I can say what I want to. I don’t have to submit it first to an editor, an editorial committee or a publisher. Even if the editorial readers are competent, they tend to be strongly ‘establishment’. Most of them have a literary or a professional translation background. My view of translation as being basically a natural, untrained phenomenon is therefore anti-establishment. It doesn’t interest them; or they regard it as marginal when it's really fundamental. Even the bilingualism specialists, who ought to know better, are rarely aware of or interested in translation. The exception among the latter is the Language Brokering researchers and educators, but there aren’t many of them and their field of study is pretty much limited to immigrant communities. Gideon Toury (see photo), editor of the journal Target and among the first to understand what it’s all about. The term and concept of Native Translator are his. Speed. If I wake up in the morning with a new idea, a new term, I can get it out to my worldwide readership that same day. Publishing it in a conventional academic journal would take one to two years: see examples in the April 29 post. At my age, I can’t afford to wait. Style. I’ve translated enough academic papers and articles in my time to know that their style is stilted and esoteric in many languages. The ritual of academic writing requires it. In a blog I can take off my stiff collar and make myself comfortable, use I, use the English contractions like it’s (which you may have noticed I’m prone to), try to be lively and clear and not sound superior. Affordability. I don’t just mean that it costs nothing to publish a blog. It’s that my younger university friends can’t afford to publish in anything that isn’t a ‘peer reviewed’ conventional medium, otherwise the academic bean counters won’t give them credit for it and it won’t advance their careers. The late David Gerver, a pioneer of research on interpreters, once said to me, “Why do universities insist that their older staff go on publishing? By the time they’re 50, they’ve usually done their best work anyway.” Well, I’m retired and I no longer have a career to further, and I think I did my ‘best work’ when I was just under 50. Preaching. One of the freedoms that blogging allows me is to preach a message. I don’t have to be neutral and circumspect. And I do have a message. I proclaimed it overtly in a post on January 1, but it underlies most of the rest. It’s that translation is not the reserved occupation of a skilled, highly educated or professional caste. It’s a universal ability and activity of everyday people. And so, on – I hope – to the second 100 posts. Gideon Toury. Natural translation and the making of a native translator. TEXTconTEXT, 1.11 29, 1986. Bianca Sherwood. Features of Natural Translation in a Language Testing Environment. Saarbrücken: VDM Verlag, 2009. Available from Amazon. Kenji Hakuta., Translation Skills of Bilingual Children. Keynote address to the Stanford Forum for Research on Language and Culture, May 14, 1988. Ricardo Muñóz Martín. Nomen mihi Legio est. A cognitive approach to Natural Translation. Paper to the 10th Jornadas de Tradución e Interpretación, Interpreting…Naturally, Universitat Jaume I, Castelló, Spain, 12-13 November 2009. To be published in the proceedings. George Steiner. After Babel: Aspects of Language and Translation. Oxford University Press, 1975. Paperback edition still in print. Theodore Savory. The Art of Translation. London: Cape, 1957. Available second-hand from Amazon UK. We saw, in the previous post, an example of how the interpreters engaged by the military as Professionals in wars and their aftermath (occupation and ‘peacekeeping’) are often in fact Native Translators without proper training. Even armies that have a core staff of Expert Interpreters don’t have enough of them, and they may be taken off guard by the need to translate unfamiliar languages. We also saw how risky the interpreters’ job can be. The number killed in Iraq, more than 360 (see below), is staggering. During the Bosnian war in the 1990s, the United Nations interpreters based in Sarajevo were under the command of a Canadian officer, Major Roy Thomas (he has since retired). After his tour of duty was over, he was shocked at how his interpreters, all locally recruited and mostly untrained, were left abandoned to their fate even though some of them were regarded as traitors by their own people for having helped out. He tried to alert the higher-ups up to their plight, but to no immediate avail although the Association of Translators and Interpreters of Ontario did give a scholarhip to one of them. Later it took a campaign in the United Kingdom Parliament to make the British government treat its army’s Iraqi interpreters decently. But now there are signs of some awakening. The following came recently from the Parliamentary Assembly of the Council of Europe (PACE). We should protect interpreters in conflict zones! This written declaration commits only the members who have signed it. In conflict zones, interpreters are on the front line. No register records interpreters’ deaths, but it is believed that, between 2003 and 2008, 360 were killed in Iraq. Interpreters – frequently ill-informed about their duties and rights – have inadequate (physical and legal) protection. With their families, they are often left unprotected in post-conflict situations and no priority whatsoever is given to their asylum requests. Lacking any official status, interpreters run serious risks. While the Geneva Conventions recognise the need for linguistic mediation in order to protect the rights of individuals, the rights of interpreters, for their part, are not dealt with in any way. - emphasise the neutrality and impartiality of interpreters, whose safety should be ensured in conflict zones in the same way as that of ICRC [International Committee of the Red Cross] staff. Then follow the signatures of 40 members of the Assembly from different countries and political parties. Major Roy Thomas (Canadian Armed Forces). United Nations Military Observer Interpreters in Sarajevo. Language International (UK), 7:1.8-13, 1995. Council of Europe Parliamentary Assembly. Document 12239. http://assembly.coe.int/Main.asp?link=/Documents/WorkingDocs/Doc10/EDOC12239.htm. My emphasis in the quotation. 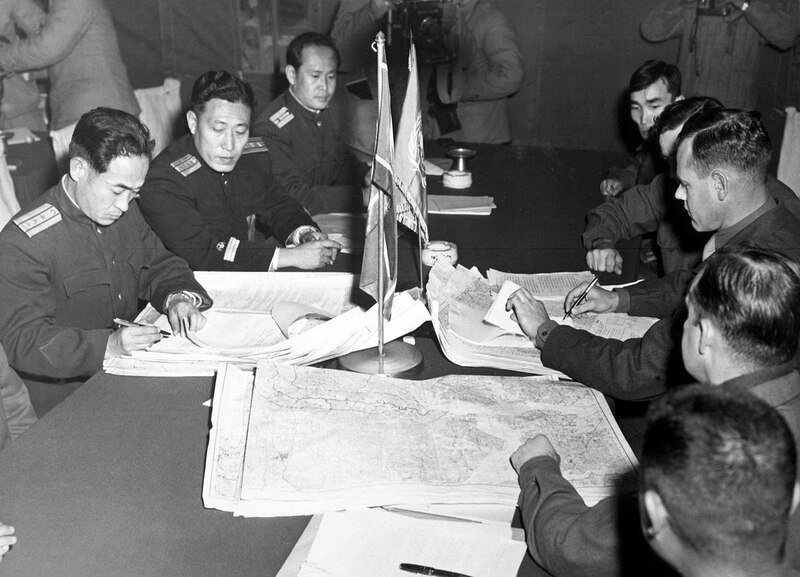 Ekvall’s book tells a fascinating tale of a life that began as the son of Christian missionaries in the borderlands between China and Tibet and led him as a US Army interpreter to the negotiating table at Panmunjom (see photo) and the armistice that halted the Korean War in 1953. Several of his books about Tibet are still available, but Faithful Echo is out of print, so I don’t suppose many people read it nowadays. Therefore I was delighted when Mariela Fernández of the University of Granada disinterred it and used it as a source for the paper she gave to the Castellón symposium last autumn (see November 18 post) on the role of interpreting in the Cold War. Mariela works in collaboration with Jesús Baigorri of the University of Salamanca, an authority on the history of 20th-century conference interpreting. Now she’s sent me an article about Panmunjom that she’s had published in Korea. Most of what follows is drawn from it. Finally, we have to point to the missionary background of the main interpreters, which brings us to the historical contribution of European and North American missionaries in the great task of spreading culture between peoples, a link that war tends to destroy. My April 10 post mentioned the effect of a missionary tradition on the language skills of the Mormons. However, Mormon missionaries are usually late bilinguals who learn their second languages in their teens. It’s the children of missionaries who are the best placed to grow up as early bilinguals. Though both sides had some Professional and Expert Interpreters, they were not enough to staff the 159 plenary sessions and 500 meetings at other levels. Ekvall had to be called back out of retirement. The shortage was particularly acute on the Communist side. Sources consulted also document the presence of interpreters from different geographic and cultural backgrounds, most of them without any formal professional training or experience. As far as we know, these interpreters learned on the spot, and their working and personal conditions were intolerable. They were recruited by force, and worked under personal risk because of the war, particularly when working with users from authoritarian regimes. For example, Millet talks of ‘a turncoat Seoul high school teacher’ (2002:260) who worked as an interpreter for the Communist delegation… He was executed at the end of the meeting because of his poor performance. In other words, it seems that interpreters without any proper training were only valuable according to their linguistic abilities, and, thus, they were highly vulnerable. The experience had transformed me from a clumsy, Chinese-challenged university student on the science-doctorate track into a member of China’s foreign policy apparatus, a low level cadre in the Foreign Ministry. I had studied hard and could now actually read The People’s Daily. I had participated in one of the seminal events in China’s new history and been witness to the devastation of war. Mariela Fernández Sanchez. Escenas de la interpretación en la Guerra Fría: mediación lingüística, cultural y diplomática. (Episodes from interpreting in the Cold War: linguistic, cultural and diplomatic mediating). Paper to the 10th Symposium on Translation and Interpretation, Jaime I University, Castellón de la Plana, Spain, November 12-13, 2009. Colonel Robert B. Ekvall (US Army Retired). Faithful Echo. Foreword by Ambassador Arthur H. Dean (former deputy to Secretary of State). New York: Twayne. 1960. There was also a later edition, but both are out of print although Amazon USA still lists one of them. Ekvall wrote extensively on Tibet and China. Allen R. Millet. Their War for Korea: American, Asian and European Combatants and Civilians, 1945-1963. New York: Brassey’s, 2002. Chaozhu Ji. The Man on Mao’s Right. From Harvard Yard to Tiananmen Square. My Life Inside China’s Foreign Ministry. New York Random House, 2008. I’ve run several posts in the past on interpreters in fiction, inspired by an article by Daniel Pageon, whose website Voiceover World is listed to the right. Here’s another. Recently we saw a Swiss film on TV called La Traductrice. It was made in Switzerland; however, the writers, the director and most of the cast are Russian, and so is a lot of the dialogue. It’s well acted, and it’s interesting for its sidelight on a certain class of present-day Russians (part of the film was shot in Moscow). I’ve seen the title translated as The Interpreter, though literally it should be The Interpretress. Her name is Ira. She’s 23 and she’s Russian, though she’s been living since childhood in Geneva with her Russian divorcee mother. Hence she’s thoroughly bilingual in Russian and French. Into her life comes Ivan Tashkov, an alleged Russian mafia godfather, who’s in prison in Switzerland awaiting trial. Tashkov has a Swiss lawyer who doesn’t speak Russian and Tashkov doesn’t speak French. Ergo, they need an interpreter. Tashkov’s interests are being looked after while he’s in prison by his Russian lawyer, Sergey, who knows Ira and her mother. Sergey thinks Ira is capable of doing the interpreting and persuades her to take on the job. The rest of the film develops from that. That’s a small point, easily corrected. More serious is the way she constantly gets drawn into personal conversation in Russian with Tashkov, much to the lawyer’s frustration. That’s a definite no-no for a legal interpreter, so I’m afraid she never qualifies as an Expert. There’s also the matter of the passing love affair she has with the Swiss lawyer. I’m not sure what the ethics are of romantic relationships between interpreter and client while on the job, so we’ll let it pass. Anyway, it’s a film. But why only semi-fictional? Because the director, Elena Hazanov, is herself a Russian woman in her twenties living in Geneva and – most important – she did actually work herself, in the late 1990s, as interpreter for the Swiss lawyer engaged by Sergei Mikhailov, a notorious Russian who had been arrested in Switzerland and charged with money laundering. Mikhailov, like Tashkov in the film, was eventually released. That experience would explain the touch of the genuine in the scene where the lawyer has his first contact with Julia; Elena was probably corrected in the same way. Alas, you’re not likely to see La Traductrice. It doesn’t seem to have made its way into foreign cinemas. Not so another film in which an interpreter plays a key role, Oscar-garlanded The Hurt Locker. This time it’s one that I’m not likely to see, despite its availability. Not my kind of film. A lot of the criticism of it that I’ve read comes from American military personnel who complain that it’s not authentic. Well, the actor who plays the Iraqi interpreter, Michael Desante, is really Palestinian, and Palestinian and Iraqi Arabic are quite distinct dialects. Perhaps someone who has seen the film can enlighten me. In the technical terminology, it’s useful to distinguish between court interpreters, those who appear in court and are impartial servants of the court, and those who translate for lawyers and other clients in legal matters outside the court itself. I call the latter legal interpreters. They're usually paid for by one of the parties and are thereby the servant of that party. La Traductrice. Directed by Elena Hazanov. Written by Mikhail Brashinsky and Elena Hazanov. Switzerland: Ventura Films, 2006. 90 min. With Julia Batinova (see photo) as Ira. Une âme russe bien traduite (A Russian soul well translated). swissinfo.ch, February 27, 2007. http://www.swissinfo.ch/fre/infos/magazine/Une_ame_russe_bien_traduite.html?cid=5737854. Last week, before I had yet another computer problem, I wrote that I would have something to say about dictionaries. Man is by nature a tool making and tool using animal. Foremost among the tools for translators, whether Expert or Native, is the bilingual dictionary. I used to work with a bookcase of them and within walking distance of a library with even more. Nowadays I only use four on paper: one each for Arabic, French, Spanish and Valencian. The rest have been replaced by CD and Internet versions of the general dictionaries, and by the many technical glossaries and term banks likewise available on the Web. Dictionary making – lexicography – has developed over the centuries into a complex and highly conventionalised competence. The front matter of Collins Spanish Dictionary needs 18 pages to explain ‘Using the Dictionary’. Probably very few users plough through all that, but the Expert Lexicographer must know it and must apply it consistently. Surprisingly, there are very few courses on bilingual or any kind of lexicography other than on its specialised sub-area of technical terminology. However, the leading dictionary publishers like Oxford University Press, Collins, Robert or Langenscheidt employ staffs of Professional Lexicographers, and there the apprentice lexicographers may learn their trade. Already at school I was introduced to some of the great bilingual lexicographers of the late 19th and early 20th centuries. For Latin, Lewis and Short; for German, Karl Breul; and for French, J. E. Mansion, a pioneer of corpus-based lexicography two decades before the invention of computers (see TERM below). At university, I got to know the monumental Arabic-English Lexicon of Classical Arabic in 8 volumes by Edward Lane, who was himself a translator (see December 24 post); and for Modern Arabic, the Arabisches Wörterbuch für die Schriftsprache der Gegenwart (Dictionary of Modern Written Arabic) by Hans Wehr, another pioneer of corpus-based lexicography in pre-computer times. This last I now use in J. Milton Cowan’s superb English translation of it – yes, the dictionaries for translators are sometimes themselves translations! Much later, in the 1970s, I encountered Colin Smith’s Collins Spanish-English English-Spanish Dictionary, which set a new standard in its field; and Eugen Wüster’s The Machine Tool: An Interlingual Dictionary of Basic Concepts. All of the above qualify as Expert Lexicographers. You can tell it from the quality of their dictionaries. In Wüster’s case, he can be classed as an Expert not only for his dictionary but also for his theoretical approach, which put a methodological foundation under the work of the technical terminologists. However, just as there are Expert (trained) and Native (self-taught) translators, so too there also bilingual Native Lexicographers, bilinguals who are not trained lexicographers but who imbibe lexicography from the dictionaries they use. And just as a Native Translator who is a subject specialist in the area of a technical text may have an advantage over an Expert Translator who is not, so too Native Lexicographers may be the best people to compile dictionaries in their own specialities. A good example would be the Emir Moustapha Chéhabi, a Lebanese agronomist, whose Dictionaire français-arabe des termes agricoles is a standard reference that has been translated into English under the title Chihabi's Dictionary of Agricultural and Allied Terminology. b) He doesn’t observe the distinction between a language dictionary and an encyclopaedic dictionary. Yet who cares? It makes his dictionary a dictionary of Hue and Vietnamese culture too. This story confirms what I have often felt about Native Lexicographers: they are fascinated by language and for them lexicography is a true labour of love that inspires in them great devotion. More to come on bilingual dictionaries. thanks to support from the National Foundation for the Humanities. 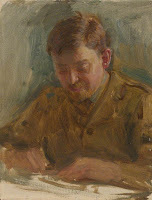 Karl Breul (Cambridge University Reader in Germanic). A New German and English Dictionary / Compiled from the best authorities in both languages. Revised. and considerably enlarged. London: Cassell and New York: Funk and Wagnalls, 1906. J. E. Mansion. Harrap’s Standard French and English Dictionary. London: Harrap, 1933-1939. The introduction describes the corpus. Edward William Lane. An Arabic-English lexicon, derived from the best and the most copious Eastern sources; comprising a very large collection of words and significations omitted in the Qámoos, with supplements to its abridged and defective explanations, ample grammatical and critical comments, and examples in prose and verse: composed by means of the munificence of the most noble Algernon, Duke of Northumberland, K.G., etc. etc. etc, and the bounty of the British government. In two books: the first containing all the classical words and significations commonly known to the learned among the Arabs: the second, those that are of rare occurrence and not commonly known. London and Edinburgh: Williams and Norgate, 1863-1893. This too is now available free online, at http://www.laneslexicon.co.uk/. Lane died before he could complete it. Hans Wehr. Arabisches Wörterbuch für die Schriftsprache der Gegenwart. 1952. Wehr started on it in the 1930s, but publication was delayed because his files were destroyed in an air raid on Germany. Hans Wehr. A Dictionary of Modern Written Arabic. Translated and edited by J. Milton Cowan. Sponsored by the American Council of Learned Societies, ARAMCO, and Cornell University. Ithaca: Cornell University Press, 1966. There have been paperback reprints. The Introduction describes the history of the dictionary, its methodology, sources, and the difficulties of modern Arabic lexicography. Colin Smith et al. Collins Spanish-English English-Spanish Dictionary. London & Glasgow: Collins, 1971. Many later editions and editors. 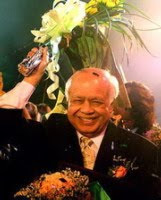 Emir Moustapha Chihabi (or Chéhabi). Dictionary of Agricultural and Allied Terminology: English-Arabic with an Arabic-English Glossary. Translated from French and edited by Ahmed Sh. Al-Khatib. Beirut: Librairie du Liban, 1978. Still in print. Corpus-based lexicography: compiling dictionaries from analyses of large computer-stored databases of text and not from the lexicographer’s own memory and personal opinions. Forerunners like Mansion, Wehr and James Murray (the first editor of the great Oxford English Dictionary) used corpora that were on paper and had to rely on manpower to search through them. Today, May 5, is the birthday of Karl Marx. So what better day for me to take up from where I left off last weekend, which was with the English translations of his classic Communist Manifesto and Capital? [A]n explanation might be expected why this English version has been delayed until now, seeing that for some years past the theories advocated in this book have been constantly referred to, attacked and defended, interpreted and misinterpreted, in the periodical press and the current literature of both England and America. a set of MS. instructions for an English translation that was planned, about ten years ago, in America, but abandoned chiefly for want of a fit and proper translator. [B]y and by, it was found that Mr. Moore's professional occupations prevented him from finishing the translation as quickly as we all desired. Therefore a second translator had to be sought. Engels found him right on his doorstep, as it were. He was Edward Aveling, the common-law husband of Marx’s youngest daughter Eleanor (see photo). Aveling too wasn’t a Professional Translator. He was, “a prominent English biology instructor and popular spokesman for Darwinian evolution and atheism.” Engels coordinated and revised the work of the two translators and he details in his Preface the contributions of each. Mrs. Aveling, Marx's youngest daughter, offered to check the quotations and to restore the original text of the numerous passages taken from English authors and Blue books and translated by Marx into German. She played the role, on that occasion, of what today might be called a Translation Assistant. But she was more important than that. Of all the translators I’ve mentioned, she was the only Professional Translator. Let’s turn to her. Certainly no critic can be more painfully aware than I am of the weaknesses...; but at least the translation is faithful. I have neither suppressed nor added a line, a word. She also translated another socially avant-garde writer, Ibsen. Professional life wasn’t easy for Eleanor. She wrote to Havelock Ellis in 1874, "I need much work, and find it very difficult to get. ‘Respectable' people won't employ me." Vizetelly went to prison for publishing English translations of Zola and Maupassant, and it broke his health. Seems incredible today. Eleanor had one other important pioneer distinction in the realm of translation. 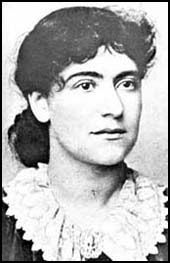 She was an accomplished Native Interpreter of English, French, German and Yiddish, As such, she interpreted for delegates to the International Socialist Workers Congress in Paris in 1889. That makes her an early modern Conference Interpreter. (Large international conferences had only recently been made feasible by the extending network of railway and steamship lines.) Certainly, to my knowledge, she was the first woman Conference Interpreter. Karl Marx. Capital: A Critical Analysis of Capitalist Production. Volume 1. Edited with a Preface by Frederick [sic] Engels. Translated from the third German edition by Samuel Moore and Edward Bibbins Aveling. London, 1887. Gustave Flaubert. Madame Bovary. Provincial Manners. Translated from the French édition définitive by E. Marx-Aveling. London: Vizetelly, 1886. Saturday was Labour Day in Spain and most of Europe, as well as many other parts of the world. Such an important event must have some connections with translation, don’t you think? We don’t have far to look. We owe Labour Day to the socialist trade union movements of the nineteenth century. One of the most influential documents in that movement was the Communist Manifesto, written in German by Karl Marx and his lifelong friend Friedrich Engels and first published in 1848. To be so influential, it had to be translated into many languages: the Manifesto itself mentions English, French, Italian, Flemish and Danish. I’ll stick to the English translation. Both Marx and Engels knew English. Marx first went to England in 1845 and moved there permanently in 1849. When I was a student in London a century later, I used to work in the magnificent Reading Room of the British Museum and liked to think that maybe I was sitting in one of the big wooden armchairs that he (or another great socialist writer, Bernard Shaw) had used. Marx had been bilingual from an early age in German and Yiddish and he also knew French. Engels’ father owned a cotton factory in Manchester, where he was sent to work as a young man. Both of them wrote contributions to English-language newspapers. In England, Engels anglicised his name Friedrich to Frederick. However, it’s clear that they thought the Manifesto needed a native English translator. Moore too was not a Professional Translator. He was a lawyer and a judge, another Native Translator who was busy elsewhere with his other occupations. However, he had the advantage of close communication with his authors and empathy with their thinking, always advantages for a translator. His work must have been to the satisfaction of Marx and Engels, because they commissioned him to do a much bigger translation, the English version of Das Kapital – but more of that in another post. We begin to see how the early history of communism was very much bound up with translation. David Black. Helen Macfarlane: a feminist, revolutionary journalist and philosopher in mid-nineteenth century England. Lanham MD: Lexington Books, 2004. There’s a brief summary at http://www.aworldtowin.net/reviews/HelenMacfarlane.html. The book includes Macfarlane’s translation of the Manifesto. Karl Marx and Friedrich Engels. Manifest der Kommunistischen Partei. London: gedruckt in der Office der "Bildungs-Gesellschaft für Arbeiter" von J. E. Burghard, 1848. Karl Marx and Friedrich Engels, Manifesto of the Communist Party. Translated by Samuel Moore. London: William Reeves, 1888. 31 p.